Ventilation Solutions - The "Altitude" Main control- How to use the altitude main control and what do all of the buttons mean. The "Altitude" Main control- How to use the altitude main control and what do all of the buttons mean. The Altitude main control is the most sophisticated HRV control on the market today. It provides the homeowner a wide range of ventilation options to meet the changing ventilation needs of the occupants. The Mode/Pref button accesses the different options. The choices are Vent, Recirculate, and Program. These are the manual settings where you tell the control what to do. The up and down arrows pick the time and speed intervals in each mode. The Set button is for choosing the options in the set up menu and setting the time intervals in the program mode. The 'Smart" button is to put the control in automatic and let it choose the most efficient setting for you based on current conditions inside and outside the house. Vent mode is where you tell the HRV how often and when you want it to come on. The choices in vent mode are 20 on/40 off, 30 on/30 off, 40 on/20off, continuous minimum speed air exchange, and continuous maximum speed air exchange. Our recommendation is to start at the 20 on/40 off setting. 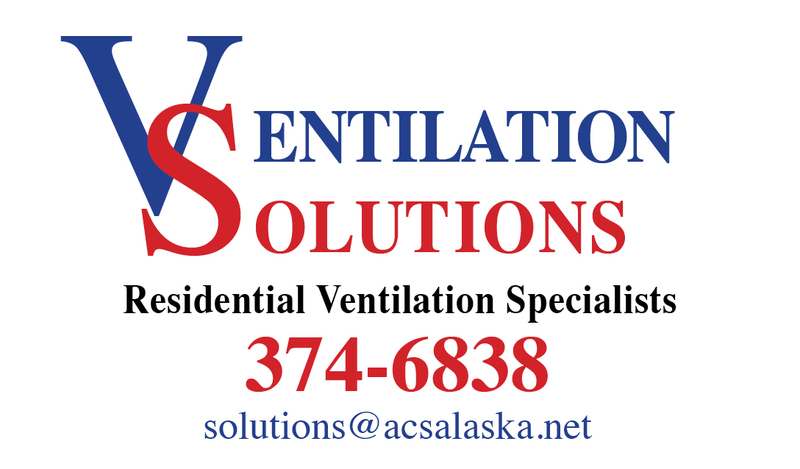 Here in Fairbanks it is very cold out most of the winter and the incoming air is so dry that it does not take a whole lot of venting to keep the humidity levels where they need to be. Electric rates are high, and so is the price of fuel oil. Our goal is to ventilate the house just enough to keep the moisture off the windows, but not so much that it creates static shocks, or causes the boiler to run any more than it needs to. In the spring or fall when the outside air temperatures are moderate, then there is a much lower energy penalty to ventilate the house. Minimum or maximum venting at those temperatures are ok. The easiest way to tell if you have the right amount of ventilation is to look at your windows. If you have water droplets on the window, vent more. If you get static shocks when you turn on the lights or pet the dog, vent less. Humidity Check- The control has a built in humidity gauge. To find out what the humidity level is at the controller, push and hold the "up arrow" for 10 seconds. The temperature reading will change and tell you the RH% (Relative Humidity). If all you see is --, then you have less that 20% RH in your house. NOTE: When in the 20 on/40 off setting, it starts out in the off cycle. Nothing will happen for the first 40 minutes. I do not know why they set it up that way, but that is why nothing happens when you first turn it on. *However if you have the control preset to recirculate when not ventiling then the HRV will recirculate first, then vent. The solo, HE, and constructo models have a low speed and a high speed recirculation option. The EKO is high speed or off. Recirculation mode will close the damper doors to the outside and only circulate the air around within the house. This mode is useful to circulate warm air from a woodstove or pellet stove around the house, or to keep the air moving through an air filter system. If you do not have either of them, there is limited benefit to running the HRV in recirculate. 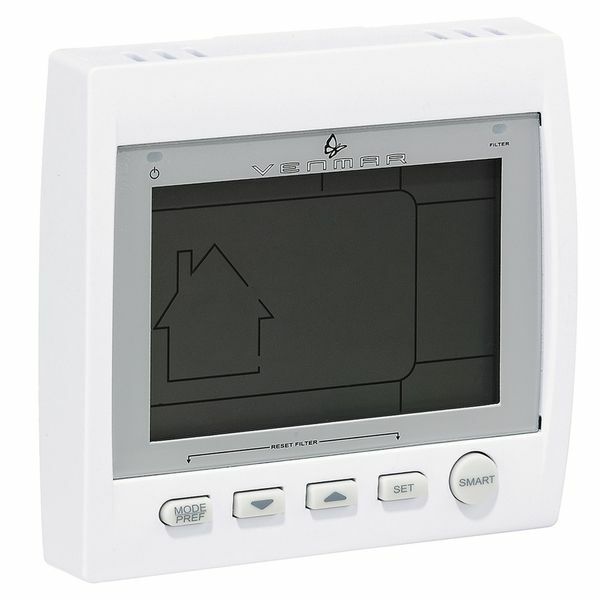 The program mode is similar to a 5-2 programmable thermostat. It gives you the ability to have the HRV run at different settings throughout the day to match your schedule. It has 4 different time intervals for Monday to Friday, and for Saturday and Sunday. This is our preferred setting in most homes. It will automatically adjust the settings on your HRV to run on an as needed basis. It factors the indoor temperature, the indoor humidity level, and the outdoor humidity level into its decision, and picks the most efficient operating level to maintain the appropriate indoor conditions. When the humidity level increases, it will vent more. When the humidity is about right, it will vent in the 20 on/40 off setting. If the humidity level drops below 25%, it will turn off or go into recirculate. The Smart setting aims to keep the humidity level in the house between 25% and 50%, depending on the outside air temperature. The smart setting also has built in temperature limits for both hot and cold weather. If it is hot out, it waits until it cools off below the setting to avoid overheating the house. In cold weather it also limits the venting on extremely cold days until it warms up above the cold weather limit. When you first turn on the HRV, you need to set the date, time, and options. To access the options menu, press and hold the mode/pref button until the seceen goes blank except for the one icon that is flashing. Use the up and down arrow to change the setting for the flashing icon. The set button will advance you to the next option. Set the day and time, then choice of time, temperature, and background color. The important option is whether to have the HRV go into recirculation or shut off when it is not venting. If you have a wood stove, pellet stove, monitor heater, or air filter system, then set the HRV to vent/recirculate. If not, then set it to Vent/off. I recommend setting the temperature limits to +80 max and -40 minimum. After setting the choices, press and hold the mode/pref button to save the changes. The orange light is a maintenance reminder, based purely on time. Every 3 months, the light comes on to remind you to check the filters. Take the filters out of the HRV, vacuum the debris off, then wash them with warm water and a mild soap. Dish soap works well. Dry the filters, then return them to the proper location in the HRV. To turn off the light, press and hold the "mode/pref" and "set" buttons at the same time until the light blinks and then goes out. This resets the time for the next maintenance reminder. If the HRV has been off, then the filters will be clean. If it has been running non stop, then the filters will be fairly dirty.